Amador County is a small, thin slice of the Sierra Nevada, created in 1854 from northern third of pre-existing Calaveras County, but the creation of Alpine County shortly thereafter limited its eastern border to the Sierran crest. All this was during the California Gold Rush when the population of the Sierra foothills peaked. Today there are development pressures in the foothills but much of the forested montane slopes remain untouched. Amador County stretches from valley grassland edge to alpine peaks. Most recent birding has been at its western edge where reservoirs, small lakes, and ponds (including 'sewer ponds' at Ione) attract waterfowl in season that are otherwise rare in this narrow county. 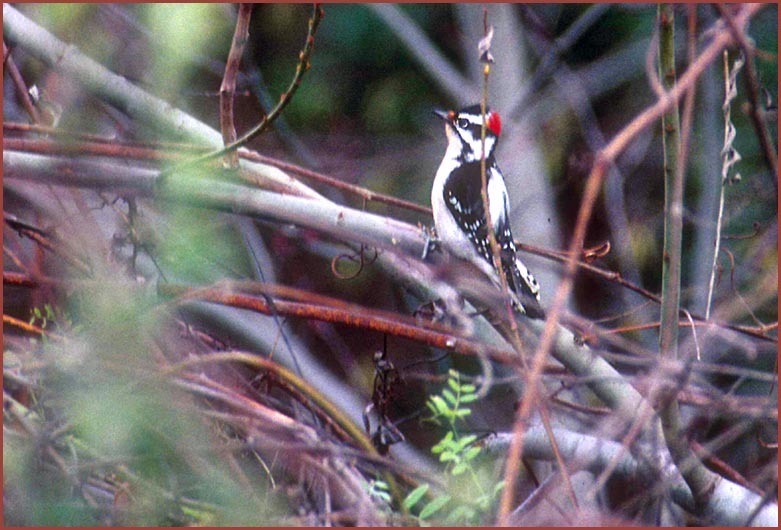 For Amador County the only photo I have to date is a Downy Woodpecker, taken across the street from the Ione wastewater ponds. I ended up rather liking the shot, though, because of all the reddish stems surrounding the little guy.